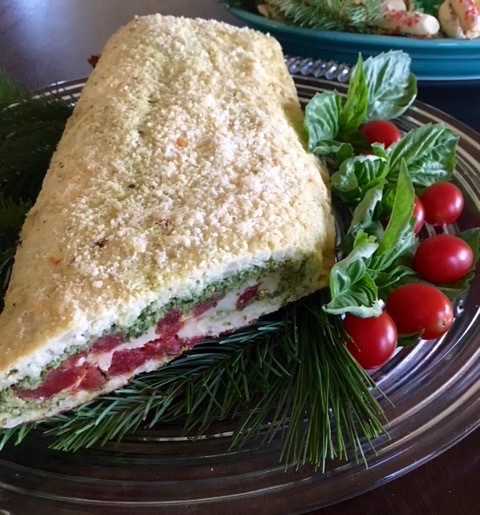 Yes, you read that title correctly—Savory Vegetarian Yule Log…and of course there’s a story to go with my new invention. Every year around Christmas time the members of Food Bloggers Los Angeles meet at In Erika’s Kitchen house with our favorite cookies and then exchange cookies with one another. It’s the meeting I look forward to the most. What could be better than catching up with friends and eating cookies. Right? Well, all that sugar on a somewhat empty stomach is a tough one. I have no problem eating all the great cookies. It’s the after effect on my tummy: Simply too much sugary, sweet goodness doesn’t always agree with me. 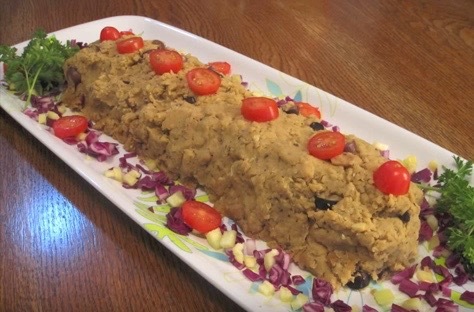 So, this year I decided to make something savory in the guise of a savory vegetarian yule log. Because I thought others would enjoy a non sugar snack as well. To the internet!!! Alas, my internet search left me uninspired. No offense, but this was not what I was looking for. But I did think that this Bacon Yule Log was funny. There was nowhere else to turn but my imagination. The meeting is in LA. Which means there are more dietary restrictions then there are people who have them. Nancy of Adventures with Nancy Rose is one of my favorite people who happens to be a vegetarian. That’s when cauliflower pizza crust popped into my head. The next image that followed was Christina of Christina’s Cucina and how easy she made rolling up roulade look. I was on a roll: I doubled the amount of my cauliflower crust. Used my 5 minute pesto, some canned plum tomatoes, shredded mozzarella and provolone and a delicious savory vegetarian yule log was created. Everyone loved the savory yule log at the meeting. Since this is my very first savory vegetarian yule log I learned that there is a reason yule logs are rolled from short end to short end. The more rolled layers the more it looks like a log. And my next savory vegetarian yule log will be rolled that way. 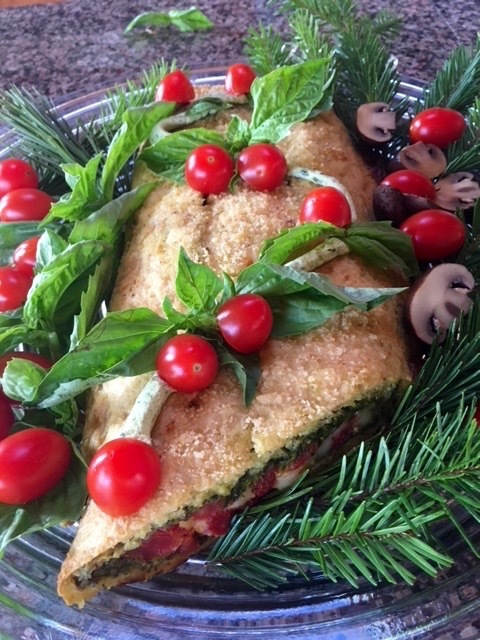 I used some of the left over goat cheese and pesto to make a garland that I added basil leaves and cherry tomato halves because the log needed to look more festive. Place a third of florets in food processor and pulse until grainy but not pureed. Place in bowl. Repeat until all cauliflower is done. Place cauliflower grains on a clean kitchen towel and ring the water out of the cauliflower. It will become a softball sized clump. Crack eggs in a medium sized bowl, whisk. Add goat cheese and fully incorporate into the egg so it is smooth. Add cauliflower, salt and pepper and combine until a 'dough' is formed. Line a half sheet pan or baking tray with parchment paper. Spread the 'dough' evenly to a rectangle. Place into a 400 degree oven for 20-25 minutes until the crust is browned along the edges. Remove crust and allow to cool to touch. Flip crust onto kitchen towel. I did this by placing the towel on the crust, put a cutting board on top of the towel and flip. Roll crust in the towel from short end to short end. Set aside and make pesto. Add garlic, pine nuts, lemon zest and a splash of olive oil to the bowl of a food processor and pulse a few times. Add about two cups each of basil and spinach and pulse until the leaves are chopped a bit. Add parmesan cheese and more basil and spinach pulse and then churn until the leaves are chopped. With motor running pour the olive oil in and blend until incorporated. Add 2 T of lemon juice, salt and pepper pulse and taste. Add more lemon juice, salt or pepper as needed. If not using right away place pesto in mason jar, pour a bit of olive oil on top to seal and refrigerate. It will keep for about two weeks. Spread a layer of pesto evenly on the crust. Arrange the tomatoes on top of the pesto. Spread cheeses of choice on top of tomatoes. Sprinkle with salt and pepper. Roll the crust so it looks like a log. Sprinkle top with grated parmesan. Place in oven and bake at 375 degrees for about 20 minutes. Let cool then decorate. This is not only a show-stopper it is SO delicious. You are a culinary genious. Haha! I was wondering about that photo until I read what you wrote! Thanks for thinking of me and my roulade 😉 This is such a unique recipe, and I’m sure it was fabulous (there’s goat cheese-squeal)! I am so bummed that I wasn’t able to come to the cookie exchange and not see all of you 🙁 A lot of travel has its consequences in ways that I had never thought of. There are not enough boldface and cap letters to truly convey how AMAZING and DELICIOUS this was! Not only was it a spark of creative genius, the flavor was outstanding and it was beautiful. It makes a showstopper of a dish sitting on a holiday buffet. I wanted to scoot it over to the edge and “guard” it so no one else got any. But that wouldn’t have been in the holiday spirit, so I had to watch as others got some, too. I’m with everyone on this! A festive,show-stopper indeed! Dorothy is right — in caps! It was just as delicious as it was gorgeous! And I’m super excited to try it as even my 13-yr-old GF kiddo can partake! Yay! And YUM! GENIUS!